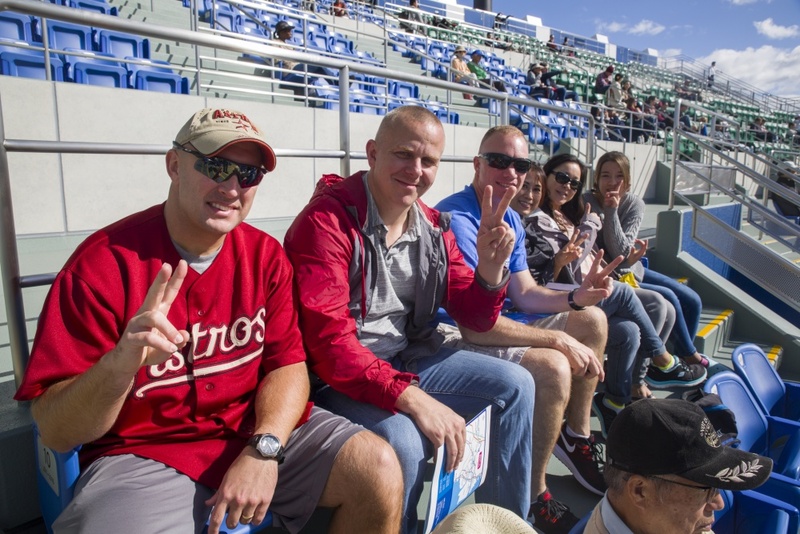 After nearly a decade of joint planning and execution between Iwakuni City and Marine Corps Air Station Iwakuni, the Atago Hills sports complex, Kizuna stadium, was finally given its grand opening before a crowd of hundreds of local Japanese and American visitors in Iwakuni City, Japan, Nov. 4, 2017. The grand opening was celebrated with speeches of pride and gratitude by MCAS Iwakuni and Iwakuni City officials, a ribbon-cutting ceremony and was highlighted by a friendly baseball game between American and Japanese high school students. Distinguished guests such as U.S. Marine Corps Col. Richard F. Fuerst, commanding officer of MCAS Iwakuni, and Yoshihiko Fukuda, mayor of Iwakuni City, who co-hosted the event together, also partook in the planting of dogwood trees, which are meant to be living symbols of the U.S.-Japan friendship. The stadium is seen as more than just a sports complex for teams to train and play in. It is a hallmark of what the U.S.-Japan friendship has accomplished in Iwakuni City. Everything from the dogwood trees planted just outside to the name of the stadium itself – Kizuna, which means bond – represents the prosperous union between two allies. The dogwood trees are part of a larger project held countrywide throughout Japan. Over one hundred years ago the people of Japan donated cherry trees that are now planted in Washington D.C. Four years ago a project was created to donate 3,000 dogwood trees from the people of the United States to the people of Japan. Joy M. Sakurai, the principal officer at the U.S. Consulate in Fukuoka and one of the leaders of the project, was invited by Fuerst and Fukuda to give remarks about the project and receive a commemorative item as the guest of honor. The stadium gave her the opportunity to continue her project in a city filled with Japanese citizens and American service members. The game ended with the East beating West, and then a second game was held where the two teams mixed so the American and Japanese athletes could play together. The stadium can seat a maximum capacity of 8,000 people and has two softball fields along with the main baseball field. Sakurai said she hopes to see the venue used in the future as a training ground for some of the U.S. Olympic teams who will come for the 2020 Olympics, as well as professional baseball teams, such as the Hiroshima Carps.